The "Pine Tree" can quite arguably be considered the number one friend in the forest. Not only can every part of this highly versatile king of the woods be used, but those uses can range anywhere from shelter and heat to food and medicinal purposes, and even some less well known uses like glue and gum! We are fortunate that so many forested areas of our country contain varieties of this majestic friend from the towering sugar pines and ponderosas in the west, the pinyon in the southwest, the loblolly in the southeast, the eastern white pine in the northeast, and many more. All told, there are between 105 and 125 species worldwide, a third of which are right here in the U.S! Here at The Frugal Prosumer we emphasize how relationships are our most important investment and asset. Without relationships we can't survive. Getting along with people is more important than how much money we have. It now looks like Gaddafi had around 200 billion dollars. Incredible! Can't even grasp those kinds of figures. But he couldn't get along with others and created bad relationships. Even his trillions could not save him. Yes, he tried to buy a lot of relationships with other African leaders but unfortunately true relationships can't be bought. Some may wonder if expensive Apple products and being a frugal prosumer are not worlds apart. At first glance there seems to be many less expensive products. I have been doing computer consulting for over 25 years. I set up businesses, schools, and nonprofits time and again and found that in the long run using apple products is a much better choice for the frugal prosumer. I no longer even try to argue the question. After working with windows, macs, consulting businesses especially in efficiency I believe I have valuable insights into when one system is better to use than the other. My first job out of college was at a solar energy firm. I got this job as result of a major research project I did on heating with solar energy. This is also when I first found out how magazines get some of their material. A major science magazine used much of my material without giving me any credit, after I had given them a tour of our company and shared my research paper with them. In my previous article on generating electricity we discussed how it is much better to use a bike for its mechanical advantage vs using it to generate electricity. Solar energy is similar. Heating your house and domestic hot water is a much better way to use solar than to generate electricity. This is not to say that photovoltaic (using sunshine to generate electricity) is not a good idea but that its pay back is much longer if at all in many cases. 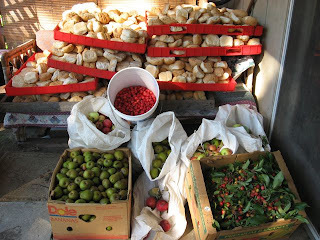 We have been collecting wild or should we say feral apples for over 40 years. Apples were very important to the earlier settlers therefore most farms had apple trees. As far as I know there is no other plant that is so versatile and produces in such abundance. I have collected over a 1000 pounds from just one tree. Apples can be eaten fresh and depending on the variety, one can be harvesting them over a several month span. You can dry them, make apple sauce, can them, make apple pie and other desserts, bake them, make cider and apple juice, and on and on. It's not unusual for us to press several thousand pounds a year. All for free. Well it does cost us gas to bring them home and some electricity to run the disposal. We also dry a lot of apples and pears. The pears are often a bonus find when gathering apples. 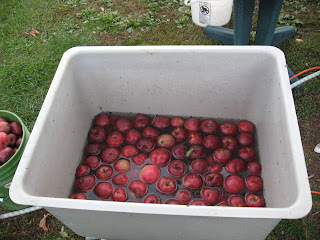 It's apple pressing season. We were out collecting apples yesterday. We also came across a nice pear tree (got about 100 pounds) and some crab apple trees. After picking about 80 pounds of crab apples it didn't even look like we had make a dent on the trees. Notice the hard rolls in the back ground. We forage in the wild as well as anywhere else. When we came across 150 dozen day old rolls for free we gathered those up too. We are drying these so we can store them for the winter to feed our animals. This is what's left after sharing dozens of dozens with friends, making croutons, garlic bread, toast, mini pizzas, dog food, etc. This is the first time we have pickled crab apples and they are beautiful. Can't wait to taste them as I have fond memories of my aunt's pickled crab apples. We'll be pressing apples this afternoon with a young man and his dad who have been on a number of our wild edible hikes. Any one who knows me, knows that I have used bikes as a major part of my transportation for much of my life. I supose this comes from living for over 25 years in Taiwan and Japan where bike riding is not a sport but a form of transportation. I own a dozen or more bikes. One for each occasion. As well as have 1/2 doz bike trailers. Both commercial and ones I have built. As a experment in Japan I onces did a house move using nothing but my bike and bike trailer I had built. Yes, even for the Japanese this was extreme and did get me strange looks. 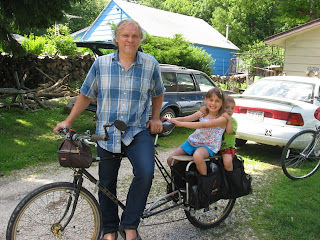 People often ask me what about generating electricity with pedal power. I tell them I'm going to start an exercise gym. Instead of people just "throwing" away their energy I'm going to charge them to generate my electricity as they loose pounds. Of course this would never work because as soon as they found out I was going to sell what they were throwing out they would not pay me any more.